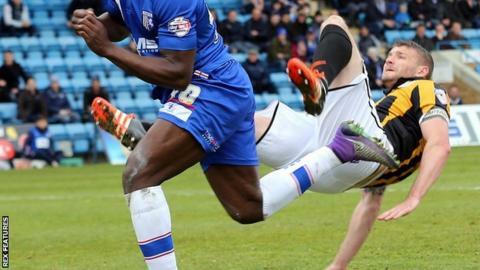 Port Vale captain Carl Dickinson has become the latest player to leave the up-for-sale League One club after rejecting a reduced contract offer. The 29-year-old former Stoke City and Watford defender was one of 13 players offered an end-of-season pay cut. But he announced on Twitter that he is the sixth player to decide not to renew his contract. It leaves new Vale boss Bruno Ribeiro, who was appointed on Monday, with only 10 contracted players for next term. But Ribeiro is already eyeing up markets both at home and abroad and the Portuguese has lined up two potential signings - both from French side Monaco, a winger and a striker - which he has told BBC Radio Stoke should send out a positive message to concerned fans in the Potteries. Dickinson, who has been linked with League Two side Notts County, joined Vale from Watford in 2013 initially on a one-year deal, prior to signing a two-year contract the following summer. He is now in the same situation as midfielder Michael O'Connor, who has already indicated that he will end his two-year association with Vale. The 28-year-old Northern Ireland international, who is keen to cut down on the daily travelling from his Lincolnshire home, is currently considering offers from three clubs in England and one from abroad. Defender Richard Duffy has moved on to non-league Eastleigh, while strikers Louis Dodds and AJ Leitch-Smith have joined League One rivals Shrewsbury Town and winger Byron Moore has signed for promoted Bristol Rovers.